National Chairperson of the IFP Youth Brigade, the Hon. Mr Mkhuleko Hlengwa MP; Chairperson of SADESMO at MUT, Mr Njabulo Khumalo; leaders of the IFP, the Youth Brigade and Women’s Brigade; members of SADESMO and students of the Mangosuthu University of Technology. Tomorrow is a significant day at MUT. Every student will be asked to cast their vote for the leadership they’d like to see on the Student Representative Council. This will be your chance to elect the right people to the right positions, so that the coming year at MUT will be characterised by support, assistance and sound leadership for all MUT students. I have come here this afternoon to speak frankly about the choices before you, because I understand how important it is that you make the right decision tomorrow. These SRC elections will have an impact on your time at MUT. They will also have an impact on the reputation of this institution, making it a desirable place to study, and an asset on the CVs of its graduates. In many ways, your time at MUT will shape your destiny. It is here that you will acquire the skills to build your future. It is also here that your character will be tested, your passion challenged and your inspiration ignited. Beyond the knowledge and experience you gain, you will also gain friends, who may stay friends for life. You’ll make important contacts for the future, and may even find your husband or wife. During your time at MUT, you may find a new passion for singing or for sport. You may find your faith strengthened and your philosophies challenged. It is not surprising that institutions of higher learning are called the seedbeds of revolution, because at this crucial time in your life, in this unique environment of learning, you have the chance to develop your own worldview. So you can see why your time at MUT is very important, and why I consider it so important that I wanted to come here in person to speak to you. I want you to be equipped with everything you need to capitalise on your time at MUT. To achieve this, the IFP has tasked SADESMO with providing leadership that puts your needs at the centre of everything. SADESMO is the IFP’s vehicle to serve at MUT. To me, the success of MUT and the success of SADESMO are very personal. I am sure you know that MUT was founded on my initiative, 38 years ago. Recently, during the Research, Innovation and Engagements Week, Deputy Vice Chancellor Professor Zodwa Dlamini invited me to address the Founder’s Dinner to speak about the birth of MUT. As always, I was pleased to remind us why this institution was birthed and what I intended it to become. At that time, in 1979, I was serving as Chancellor of the University of Zululand. As I capped each successive years of graduates, I often heard them lament that a degree would not translate into work. And it was true. Our economy was in distress as international sanctions and disinvestment saw jobs drying up. So even though young people were investing in their future by studying towards a degree, when they left university there was little chance of earning an income. What we needed was an institution of higher learning that could impart vocational skills. We needed somewhere that young South Africans could be trained and equipped with the kind of skills that the job market needed, so that the moment they graduated they could walk into a job and start earning money. I pursued this idea on behalf of our youth, and secured funding from the Chairman’s Fund of the Anglo American and de Beers Group, through my friend Mr Harry Oppenheimer. Mr Oppenheimer was an astute businessman and a philanthropist, who was committed to building our country’s future. Thus the Mangosuthu Technikon was born, and year after year it attracted more students, becoming a beacon of hope not only for our youth, but for our economy and our future. The students who graduated from this institution were able to become South Africa’s labour force. They became our engineers, our marketing managers, our conservationists and chemists. They became our activists, the unifiers of our communities, and the influential leaders of our nation in their chosen fields. Thirty eight years later, that legacy continues. You are the next generation of students; the future graduates who will trace your success back to your time at MUT. But none of this is a given. Studying is hard. It demands an enormous investment and enormous sacrifice. Many of those who start, never finish; and all of those who finish have a story to tell of hardship and challenge at some point in their journey. The costs alone to get a higher education are very steep. We are still fighting for the promise of free higher education, but even then there will be the reality of accommodation, books, food, data, and all kinds of expenses that must be paid by every student. It is a simple fact that there isn’t enough to go round. Even NSFAS is struggling, as good as it is in theory. So you need someone on your side while you study. You need someone with your own best interests at heart, who knows the system, and has the authority to engage with management on your behalf. You need someone who can tell you where to go and who to speak to when you face a problem. You need someone to speak for you at the highest level, to ensure that your needs are met in a way that enables you to focus on learning. After all, that is what you are here to do. Fortunately, there are people ready to serve you! The leadership of SADESMO is experienced, equipped and ready to lead the Student Representative Council at MUT. When they ask for your vote tomorrow, they are asking you to partner with a leadership that works, with you and for you. This is a leadership that knows MUT and knows how to make your time here the best it can possibly be. I can say this with confidence, because SADESMO subscribes to the values and vision of the IFP. 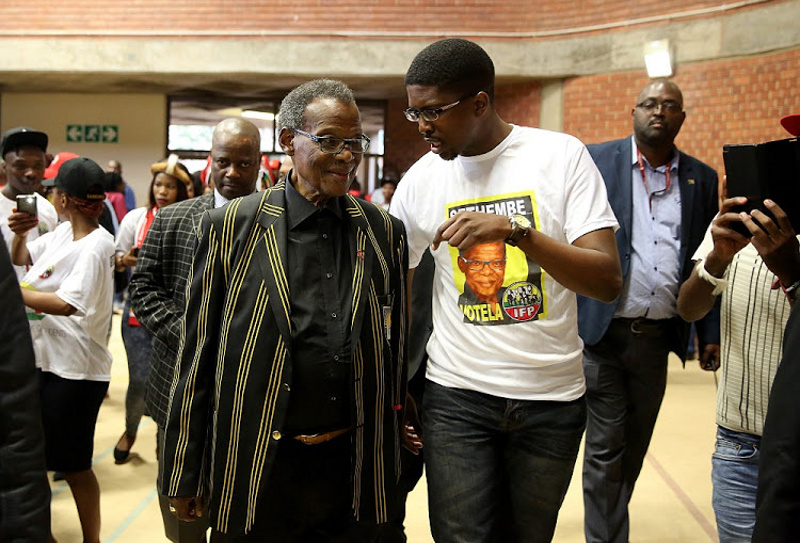 The IFP holds them accountable for working with integrity and openness. We make sure that they are available and accessible to students in need, that they follow things up, and are a good example of the kind of leadership we have in the IFP. I was proud of SADESMO for winning four seats on the SRC last year. But it worried me that SASCO won five. Because the vision and values that SASCO subscribes to are so different from ours. I want to speak to you openly, as intelligent young people. I believe you have the discernment to know what is in your best interests and what is not. But I also believe that you aren’t being told the full story. You deserve to hear more than slogans. You deserve to know the facts behind the things that are said. Let me give you an example. Former President Nelson Mandela is often quoted saying wonderful things, like “Education is the most powerful weapon which you can use to change the world”. But his party campaigned under the banner “Liberation Now, Education Later”, believing that they could first change the world and then worry about education. It’s often tempting to believe the catchy slogans. But unless we know the truth behind them, we’re not going to win a better future for ourselves or for our country. I want you, therefore, to understand the facts behind SASCO’s philosophy of destroying capitalism and ushering in a socialist society. That is SASCO’s stated vision. The problem is that socialism is highly destructive to a nation’s economy and a people’s wellbeing. History contains a long list of struggling countries, whose struggles began when they embraced socialism. I must admit, I grew up in the ANC Youth League at the University of Fort Hare. Like all young activists, I admired the idea of socialism. In the seventies, of my own accord, I studied the work of President Julius Nyerere, the father of African Socialism, called Ujamaa. Indeed, I went to visit him in Tanzania to discuss his thoughts. I discovered, however, that by that time he was already questioning socialism, based on his experience of what it had done to Arusha. He gave me his latest book “Ten Years After Arusha” and warned me to consider what this system had done to other countries throughout the world. The impoverished Soviet Union was the clearest example. To this day I am grateful that even President Mandela converted from socialism and communism when he became President of a democratic South Africa. He realised that we would not be able to create the just and prosperous society we dreamed of, unless we embraced a free market economy. Unfortunately, the present ANC leadership is so reliant on votes from their alliance partners, COSATU and the SA Communist Party, that they’re afraid to commit to any clear economic policies. That’s a problem for our country, and in the end it affects you. It affects the likelihood of free higher education. It affects your chances of getting a good job, of making money to help your family, and of eventually being able to afford a car and a house. I remember when the economy of Bulgaria collapsed in 1990, because of socialism. A family living there had been saving for years to buy their own home. But overnight the money they’d saved became so worthless, it could barely buy a new fridge. In a country with a strong economy, high employment and consistent growth, we could put measures in place to fight inequality and raise the poorest of our people out of poverty. A free market economy can create that those conditions, and that’s the kind of economy the IFP champions. On the contrary, socialism weakens a country’s economy; and where poverty is almost universal, equality is fairly meaningless. I am telling you all this because I want you to really think about the worldview behind your student leaders. Do you want the kind of leaders who give you catchy slogans about creating equality, while their politics can only create mediocrity? Or do you want the kind of leaders who see your potential and are here to make sure you get the chance to become all that you are meant to be? I hope you will choose SADESMO leaders, because I want MUT to be a place of excellence. I want this university to produce graduates of exceptional quality who are ready to raise the bar in our country in their chosen field. I have nothing against the leaders of other student movements. But I believe that leaders must lead people in the right direction. It’s not just about how nice you are, or how popular. It’s not even about how sincere you are, because it’s possible to be sincere, and still be sincerely wrong! We must choose leaders who are backed by a sound vision, a constructive worldview and a broader leadership of integrity and wisdom. That’s the kind of leaders you get with SADESMO, because they’re backed by the IFP. I therefore encourage you to vote in the SRC elections tomorrow, and to empower the leadership of SADESMO at MUT. Let’s get SADESMO the majority of seats, so that the leaders who serve our students will lead in the right direction. Finally, I want to take this opportunity to wish you well as you prepare for exams. Keep working hard, because tomorrow’s success is built on the work you do today. Thank you for welcoming me. It’s always good to be here.